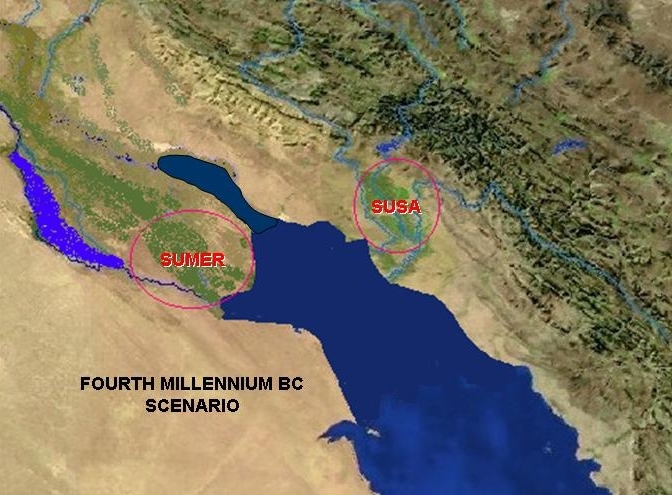 To recap broadly, the conditions of Gen 2.4-6 can be demonstrated to match very well the conditions of lower Mesopotamia at more or less any stage after the climate became more arid after the ice age, especially around 3800BC, and irrigation of the annually inundated alluvial soils began in earnest, of necessity, under the Ubaids. The four rivers of v10ff match the Tigris, Euphrates, Karun (the Gihon, still winding through what is now Khuzistan, the ancient land of Cush – Elam, not the Cush designating Ethiopia in the Bible) and the “fossil” river that now ends in the usually dry “Kuwait River”, which ran round the land of Havilah in the Arabian peninsula, where gold was mined until the 1950s, and where aromatic resin was a major export throughout antiquity. But this last river dried up c2500 BC, making any historical recollection of it necessarily prior to that early date. But in 2500BC, the sea level was also much higher than it is today, having reached a peak perhaps 500 years earlier, close to the ancient cities of the area such as Eridu. Only in historic times – much later than any date for the writing of Genesis – has the coastline retreated far enough to allow the possibility of the latter two rivers forming a confluence with the Tigris and Euphrates – only since the Pishon has long been dry, that has never become possible again. The last factor to be accommodated is the confluence in Genesis 2 between the Tigris and the Euphrates themselves. Nowadays they join at al-Qurna to form the Shatt-al-Arab to the sea, but though the nature of the land has caused many variations in the two rivers’ courses, historical records suggest that, having had separate outlets from the early third millennium or before, it was only around 100BC that they first rejoined each other. Once more that is far later than any possible date for Genesis. However, this extremely illuminating survey of the interplay of the various physical processes in the development of the lower-Mesopotamian geography show that there was a time, before the fullest extent of the sea-level rise c3000BC (coinciding with the most likely historical date for the Flood), when the rivers did flow together for the last part of their course, as Genesis describes. This would, as the link shows, have been in middle of the third millennium, going back perhaps into the fourth – in other words, remarkably consistent with the “Ussher” dates for the Eden narrative. In other words, if the remarkably detailed Genesis topography is not sheer fiction (and why, and how, invent an imaginary confluence of rivers which, at times, have had a real confluence? ), then it must be recalling the land as it was way back in the 3rd, or even 4th, millennium, centuries before the earliest written records we have from the region. The only real loose end I see in this (based on the linked web-page) is that the advancing northern arm of the Persian Gulf, separating Sumer from Susa (Khush) seems to give the Karun River (aka Gihon) a separate sea outlet. But as the author admits, precise reconstruction of such a complex system is extremely difficult. It may well be that there was, indeed, a time when all four rivers flowed into a single confluence in the centre of the developing flood plain, but if so it must have been for a historically brief period. Incidentally, the people dwelling across that arm of sea – which was certainly crossed for trading purposes in the third millennium – were of a different ethnic origin to those in Sumer. This would make a very plausible site for Cain’s exile amongst a potentially hostile people. There is certainly every prospect that further scientific work will give a much more detailed history of the Gulf coastline and the courses taken by the various rivers. If that happens, it seems very possible that a historical window will open on the text of Genesis 2 that enables remarkably close dating of the events based on the physical geography in the account. The text would match the geography at that time, and at no time before (as the climate was wetter, and the sea-levels still rising after the ice-age) or after (for the reasons I have described above). That wouldn’t guarantee the story’s truth, of course – but it would suggest a near-miraculous preservation of pre-historic geophysical detail down to the (relatively) late date of the final composition of Genesis. Such a remarkable memory would, I submit, only be preserved because of an equally remarkable event, and would almost certainly be a “folk-memory” rather than the gleaning of some exiled scribe from cuneiform tablets in the Persian age. Sorry, Jon, but I’m going to throw up a few caution flags here. 1. Even if the four rivers met before flowing into Eden and then into the sea, as you postulate, it still doesn’t match the description in Gen. 2:10, which says that the river flowed from Eden and separated into four headwaters, not that four rivers flowed into the river that subsequently flowed into Eden. As you said in your linked article from May, it is not plausible to interpret the text literally as it is written, since actual rivers do not behave as the river in Gen. 2:10 does. To me, this is yet another indicator that the text was not meant to be taken literally. The ancient reader certainly would recognize this non-natural feature, too. 2. You seem to be equating Gen. 2:4-6 with the time period after 3800 B.C., based on newly arid conditions and the need to irrigate. Irrigation had been practiced by the Ubaid culture in Mesopotamia for 2000 years before this. They built an irrigation canal as early as 6000 B.C. at Choga Mami, near Baghdad. (1) The commentaries are divided on how to interpret the “four heads”. Take the text “non-realistically” and you end up with two easily identified rivers flowing bizarrely backwards in the same region (one identified by a real city), one flowing in a known region nearby described by its trade products but for some reason “symbolically” named for the spring in Jerusalem, and one unaccountably flowing all around Ethiopia or Upper Egypt, a country of no relevance either to Israel or the extent of the world and a continent away. However, take the alternative interpretation and you have four identifiable rivers of antiquity named in geographical order. 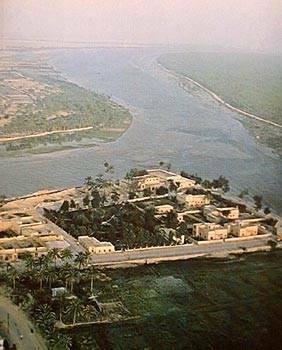 (2) The 3800BC figure was, according to my source, the time at which irrigation became “industrial” – my piece was careful to say the conditions fitted any time after the drying of climate, when lower Mesopotamia became watered almost entirely by inundation. (3) Eden is a geographical region of unknown extent which is simply named in the text as existing: all we are needing to make space for is a garden where entry was restricted, the like of which, as sacred precincts, certainly existed at that time. Think “God planted a garden in Orange County”. Just as we’re not treating every detail of the story as necessarily literal in this genre, so we’re not adopting the traditional assumption of an unpopulated world with tame lions wandering around, derived only from the lack of overt mention of the surrounding population. But if “Eden” is a named territory rather than a physical decription (and the scholars seem to have gone that way), then it had a population. The fact that it was Yahweh’s garden gives us scant information about how, humanly speaking, it was established, just as Adam being formed from the adamah does not preclude “natural” means being involved. Adapa, in the myth, was similarly said to be created from the earth, and yet his job was to advise the men of Eridu as a sage. 1. Well, setting aside the so-far unidentifiable Pishon and Havilah, between the known locations of the Tigris and Euphrates, Gihon in Israel, and Cush in Ethiopia, you do have an identifiable region. The East African Rift runs from Ethiopia across Yemen and straight up the Jordan valley into the Middle East. 3. Even if Eden was only 10 acres, setting it astride the confluence of at least two major rivers before they empty into the sea makes it a little hard to hide. I live by a river that runs through a semi-desert. The Pueblo Indians have been farming the Rio Grande for more than 1000 years, and every inch of riverfront has been claimed as ancestral plots for at least that long. I just can’t conceive how a literal garden could be dropped onto a major waterway dotted with cities and go unnoticed. Jay – on the “unnoticed” garden, there seems no reason to me that it had to go unnoticed: merely that it be private. Nothing being mentioned of Adam’s people-group, if any, we can say nothing about who knew what when. One interesting thing I chanced upon in researching this piece bears on the way things either appear, or not, in historical records. That is, even if an astonishing garden were somehow so notable as to be remarked upon in the populous lower Euphrates, we need not have any record of it outside the Bible. One of the maps in the article I linked to mentions a probable meterorite crater, which a bit of searching shows to be the Umm al Binni Lake, slap bang in the middle of the delta. At the time this impact happened (apparently between c2500-2200BC – more broadly 3-5Ky ago), it would have landed offshore in about 10m of water, creating a massive tsunami in a major area of literate civilisation interested in omens and astronomy. 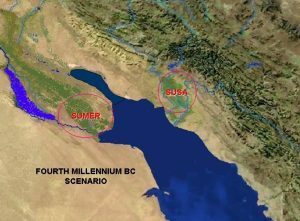 Yet although it has been suggested to have caused the demise of the Sumerian civilisation, there is no contemporary record of it, nor so far any physical evidence apart from the crater. Wikipedia mentions speculations about its being the cause of the famous Flood, but all the Babylonian sources clearly state massive rains as the cause of that and (unlike the biblical Flood narrative) omit references to floods from below, as has been noted by scholars. My point is that if you can lose from history a 100m asteroid (or 300m comet) impact maybe 60 miles from Ur (and just offshore from Lagash) which “would have devastated coastal Sumerian cities”, then you can lose a garden, too. Maybe so. Blogger gets the last word! Elam is not cush. Elam was mentioned right away. There is no reason to say Cush is Elam. The people then knerw what Cush was. A nation in Africa. This was before the flood as said before. The river, freshwater, separating into four heads does not work where today it would be a salt sea. It would work where Cush/Africa is included and everything goes war to the south into the sea. Anyways the continents moved as both creationists and evo geologists agree. It was first a single mass of land. one must remember what the audience would think and why the author had to make it clear. This because the whole area did not exist anymore. If it did the author could of said such and such a nation now dwells. there. If the areas described didn’t exist any more, then there was no point in describing or naming them for contemporary regions. In the context in Ezekiel 38, the group involved is associated with Persia or Iran and is therefore most likely the eastern Ethiopians, while the context of Daniel 11 is of the region around Egypt which indicates the western Ethiopia in Africa. This is borne out by the Hebrew tradition which has two major regions where the descendants of Cush settled. The most commonly understood is the one in Africa. However, there was an eastern segment. This is preserved in the old names of Khuzistan (Cushistan) and the Hindu-Kush range to the east of Persia or Iran. So the two traditions are the same. Again, it seems that the Eastern Cush comes with Persia or Iran in Ezekiel 38, while the western, or African, Cush is the one in view in Daniel 11 where Egypt is in focus. So as in my reply to Jay above, one either insists on “Cush” in Gen 2 as modern Ethiopia and then has to invoke either un-interpretable myth, or entirely fictional Flood Continent Shuffling, for which there is no evidence either in Scripture or in science. Or, as I have done, one can take one of the alternative biblical designations of Cush, one that is even preserved in its modern name of Khuzistan, and find the text makes perfect sense geographically. Cush has always not been certain even in previous centuries from those studying this. I don’t know Khuzistan is the word for cush. its been so long. likewise these would be distant areas to the audience reading the bible. U agrere the author named the rivers/area etc to make a definite geographical point. however no river flowed from somewhere and became four heads while staying fresh water. The water flowed south to the sea by the time of writing. It seems to me more likely Cush meant the great nation they knew. indeed named after a original man. Indeed the Tigres not being mentioned would be a issue. Finally the river flowed out of eden, then watered the garden(howevder accomplished, then on its merry way to four heads. Either the original readers were confused or got it better then us.